It's free spins week at Intertops Poker and Juicy Stakes Casino. Starting March 1st and continuing until the 7th, when you deposit at either of the casinos, you can get up to 100 free spins on some of your favorite Betsoft slot games like the mystical Tiger's Claw and the enchanting Faerie Spells. Intertops Poker and Juicy Stakes Casino welcome players from all over the world. They host busy poker rooms on the Horizon Poker Network and offer slots and table games from Betsoft, Lucktap and Worldmatch. "The more you deposit, the more free spins you get," explained Intertops Poker's casino manager. "But this weekend, and till Thursday, we'll throw in some free spins with even a $25 deposit!" In Tiger's Claw, players are guided through a mystical fantasy world in a quest for gems and artifacts. When a white Tiger's Claw grasping a glowing orb appears on all five reels, eight free spins are awarded. In the magical new Faerie Spells slot game, the Faerie Queen can reveal win multipliers or trigger the game's unique four-tiered jackpot game. 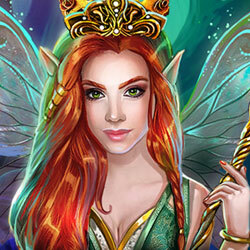 Three Faerie Queens transport you to the enchanted free spins realm where secret faerie treasure is scattered across the reels. Scatter symbols explode allowing new symbols to take their place and create more wins. "Tiger's Claw is a 3-4-5-4-3 slot game. There are three rows on the first and last reels, four on the second and fourth, and five on the tall middle reel," said the casino manager. "I can't think of another game like that. It creates 720 ways to win though -- many more than a standard 5x3 game – so no wonder players like it!" An eccentric Inuit inventor and his yeti sidekick search for treasure in the Arctic in the new Yak, Yeti & Roll. 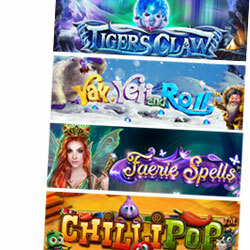 Cascading symbols award up to 200X prize multipliers and up to 8 free spins. 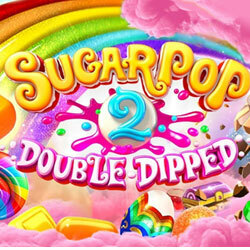 Chilli Pop is a cluster-based, cascading slot game. Three or more scatters trigger up to 26 free spins where the Mexican fiesta really heats up. The party is just getting started at Intertops Poker and Juicy Stakes Casino! 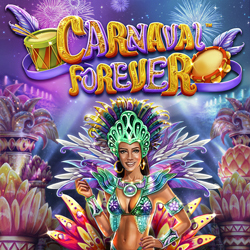 Betsoft announces their new Carnaval Forever slot and until Friday, get 5 free spins on the new game. Versions of Mardi Gras and Carnaval date back to the Ancient Romans. Citizens used this ritual to honor Saturn, the god of agriculture. It was a week long festival when work and business came to a halt. Schools and courts of law closed, and the normal social patterns were suspended. Beautiful dancers in exotic costumes adorn the screen in the new Carnaval Forever online slot game. Three or more Carnaval Queen symbols can trigger up to 9 free spins. If you are eager to enjoy the ultimate thrills of carnaval, you can simply buy free spins. "Carnaval is a time when people free to themselves let go and have a good time," laughed Intertops' casino manager. "We're all about fun around here. I think our players already know how to have a pretty good time but Carnaval Forever gives them one more way!" As CryptoSlots.com continues to grow in popularity, so does their growing collection of online slots and video poker games. 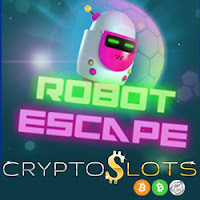 The cryptocurrency-only online casino created by Slotland has added their 34th game, the futuristic new Robot Escape with free spins and sticky wilds. To celebrate the new slot, CryptoSlots is giving you a 40% deposit bonus for playing Robot Escape and another 20% bonus for all games except the $1,000,000 Jackpot Trigger (which is played with tokens won while playing other games). Robot Escape is a 20 pay-line penny slot with free spins and sticky wilds. You can bet as little as a penny per line or as much as $500 per spin. Three or more Free Spin symbols trigger up to 10 free bonus spins. Sticky Wilds randomly stick in their position for the next spin, often repeatedly, creating lots of opportunities for crypto-mazing payouts. CryptoSlots now has 24 provably fair slots (7 of which are high limit versions), 9 video poker games and a one million-dollar jackpot game. (Jackpot Trigger is played with tokens collected while playing other games and can pay up to $1,000,000 on a single spin.) All games can be played on any computer, smartphone or tablet. Playing slots and video poker, you'll automatically earn tickets for the casino's monthly Crypto Lotto. A progressive prize, first place is always at least $10,000, second prize is $5000, third prize is $1000. Min. deposit $30. May be redeemed 5x per day. Wagering requirement 35X. Valid for Robot Escape only. May be redeemed 2x per day. Wagering requirement 35X. Valid for all games except Jackpot Trigger. 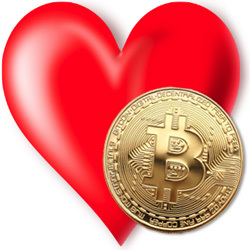 CryptoSlots uses only Bitcoins, Bitcoin Cash and Litecoins for deposits and withdrawals. "Cryptocurrency is ideal for online casino players," said CryptoSlots manager Michael Hilary. "It's quick, easy and secure, and fees are low." Rival Gaming's new Hot Hand slot comes to Slots Capital Casino's collection of real money online slot games, and this one is a scorcher! Until Friday, you can get your hands on 20 free spins for the new game, but be careful not to get burned because this new game is red hot! An up to $1000 introductory deposit bonus is available until the end of the month. 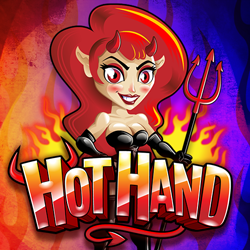 The new Hot Hand is now available in Slots Capital's download, instant play and mobile casino games along with hundreds of unique online slots and table games from Rival Gaming. Hot Hand is a red hot 3-reel slot with fiery versions of classic symbols like Hearts, Spades, Diamonds, and Clubs as well as blazing Bells, combustible Cherries, glowing Gems, sizzling 7's and Burnadette the she-devil spinning on its reels. Adding fuel to the fire are 2x wild multipliers on the first reel, 3x wild multipliers on the second reel and 4x wild multipliers on the third. Hitting more than one multiplier on one spin can produce ferociously flaming wins. You can bet as little as one penny or as much as $75 per spin. Available until February 28, 2019 only. Available to all players that have made a previous deposit in February. Available until February 22, 2019 only. 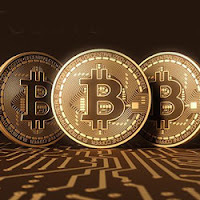 Intertops Poker and Juicy Stakes Casino want you to discover just how quick and easy it is to use Bitcoins at the two casinos. From February 18-24, if you make a deposit using Bitcoins, you will get up to 20 free spins on a choice of four slot games or free tournament tickets for the online poker rooms' Sundowner poker tournaments. "We introduced Bitcoins as an option for deposits and withdrawals in 2016," said Intertops Poker's casino manager. "Since then, thousands of players have discovered how easy, secure and fast they are!" Using Bitcoins, there's no need for any extra sign-ups or PIN-typing which could be collected by spyware or other malicious actors. Bitcoin transactions are secured by military-grade cryptography. With no intermediaries, no fees and no waiting time, sending coins across borders is as easy as sending them across the street. If you choose free spins, you can take them on any of these slots found under the Betsoft tab in the casino section of the site: Sugar Pop 2, Rockstar, Black Gold or The Exterminator. Free spins will be added to your account within 48 hours. You can win up to $250 with your free spins (after fulfilling 30X wagering requirement). 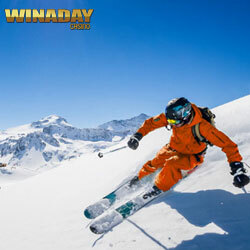 $1000 GTD Sundowner Tournaments are held Monday through Saturday. Every Sunday there's a $4,500 GTD Sundowner. Tournament times and details are available at https://poker.intertops.eu/en/promotions/tournaments and https://www.juicystakes.eu/poker/tournaments. All games are No-limit Texas Hold'em with various starting stacks and blind levels. Intertops Poker and Juicy Stakes Casino welcome players from all over the world. In addition to their busy poker rooms on the Horizon Poker Network, they also offer slots and table games from Betsoft, Lucktap and Worldmatch. After your deposit, you must email their casino host (casinohost@intertops.ag or casinohost@juicystakes.eu) to let them know whether you'd like a free poker tournament ticket or free spins on slots. 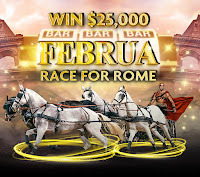 Rich Casino's latest big money promo, Februa – Race for Rome! 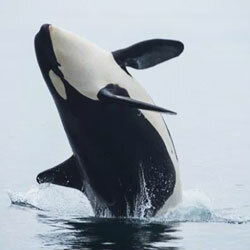 is named after the Roman month of festivity from which we get the word February. The player who accrues the most cumulative points in this race will triumph, with prizes all the way up to twentieth place! The Februa – Race for Rome! Races' minimum bets vary depending on the hour. Each player is allocated 125 spins and each race runs for 25 minutes. 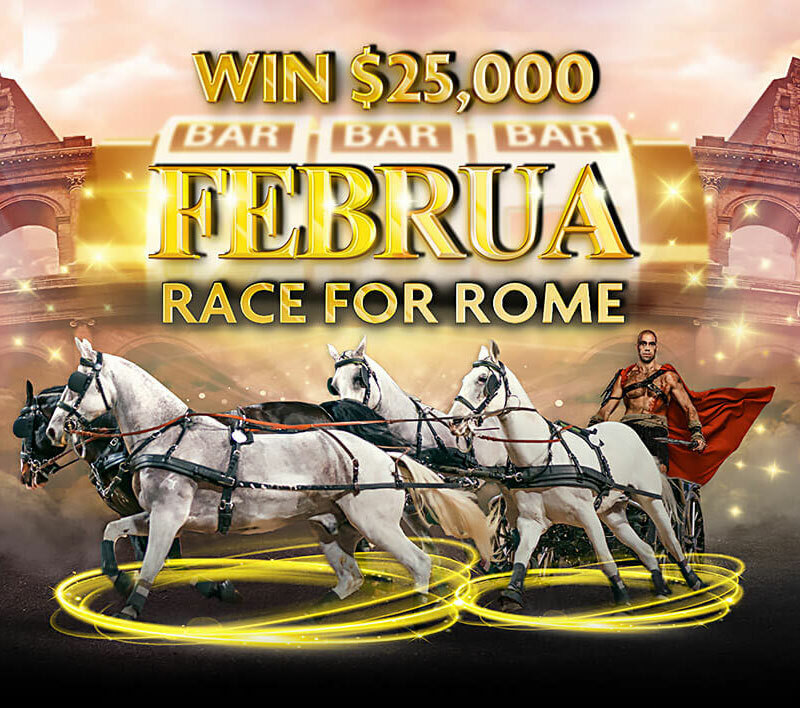 The Roman themed championship conjures images of ancient Rome, charioteers and revellers at the Circus Maximus, and with low minimum bets of under $1, it's inexpensive, fun to play and easy to accrue points over the course of the month! "Februa – Race for Rome promises to be a thrilling successor to last month's Janus Race for Rome championship which received very positive feedback from our players!" Gwen Adams, Rich Casino spokesperson said. "With so many Races over the course of the month, and with so many points at stake, the chances of making it onto our championship leaderboard and into the big money are very high indeed!" added Gwen.